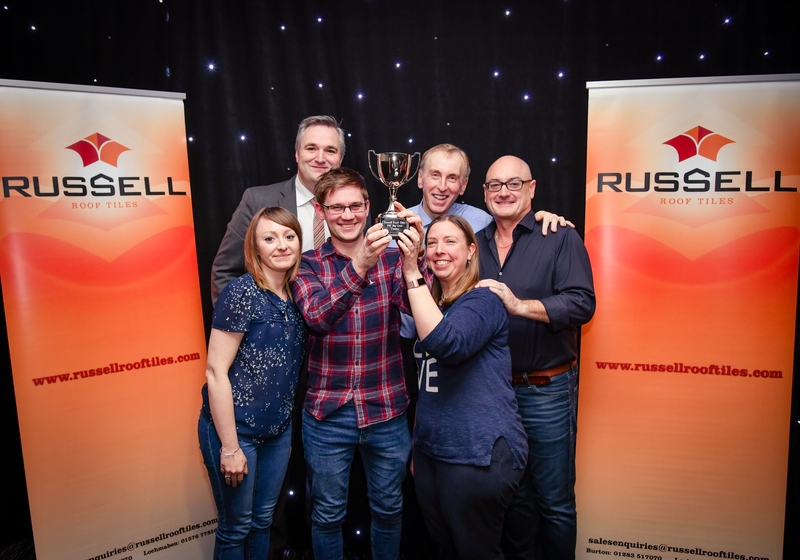 Burton-based Russell Roof Tiles’ annual Big Quiz has raised an impressive £6,500 for charity, adding to its ever-growing pot of donations for local charities. The roof tile manufacturer, which currently employs 100 people at its two sites based on Nicholson Way and Wetmore Lane in Burton, held the well-attended event at Burton Albion’s Pirelli Stadium. 44 teams of four, including customers, staff and suppliers – roofers and architects from across the area, battled it out to take this year’s champion position. The crown went to law firm Geldards LLP, based in Derby, who were awarded with a trophy, £50 each and a bottle of wine for first place. Second place went to Scottish firm, Alexander Steele Recruitment whilst a Russell Roof Tiles team comprising of Transport Manager, Stuart Ogden, Transport Planner, Tom Baron, Sales Executive, Rhodri Jones and Area Sales Manager, Michael Palmer, came in third. More than £3,000 was raised via a nail-biting auction with one generous attendee bidding a staggering £700 for a boxing a glove signed by the British sporting legend, Anthony Joshua. Lucky raffle winners also took home fabulous prizes of spa vouchers and football stadium tour tickets. Money raised from the evening’s events went into the Russell Roof Tiles’ Community Fund, which was introduced earlier this year and benefits charities, such as Shropshire.Staffordshire.Cheshire Blood Bikes and Mona C Allotments in Burton. “The second year of our Big Quiz event was a triumph. We would like to thank everyone who attended for their fantastic support. A special thank you also goes to Burton Albion Football Club for providing us with the fantastic Pirelli Suite to host the event.